Boogie Wipes are saline disposable wipes for cleaning snotty noses without the sting and redness. Between October and March it seems everyone, especially children, have runny noses. As spring approaches slowly, we hope for a time when nose wiping is minimal but for now, those germs are making their way around schools and groups of children like nothing else. It seems to me like 2 out of 3 kids I see have red, raw noses. Does Your Child Wipe His Nose On His Sleeve? It could be laziness, but it could also be because it’s softer than tissues and his nose hurts. Boogie wipes are not just soft, they have saline in them which helps to HEAL raw noses. I’ve even used them on myself. At first it feels weird using a wet wipe on your nose but the saline really cools the area. Isn’t Disposable Bad For the Environment? If you use handkerchiefs, then this isn’t for you. However if the alternative is tissues, then in my experience using Boogie Wipes, we used less wipes than we would have tissues. It doesn’t hurt to wipe or blow so we blew harder and got more out at once. Also since they are thicker, there was no “leakage” through to the other side so we could use more of it. What are Boogie Wipes Made Of? Boogie wipes are alcohol free and hypoallergenic and is gentle enough even for babies. It has Vitamin E, Chamomile and Aloe in it to moisturize. They come in Fresh Scent, Unscented, Great Grape and Minty Menthol. Boogie wipes are available at many different retailers in the US and Canada such as Walmart, Target, Toys R Us, Shoppers Drug Mart and more. 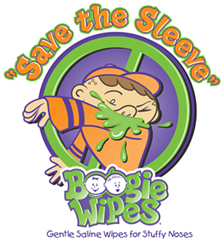 Save the Sleeve is a children’s website run by Boogie Wipes with games and information.